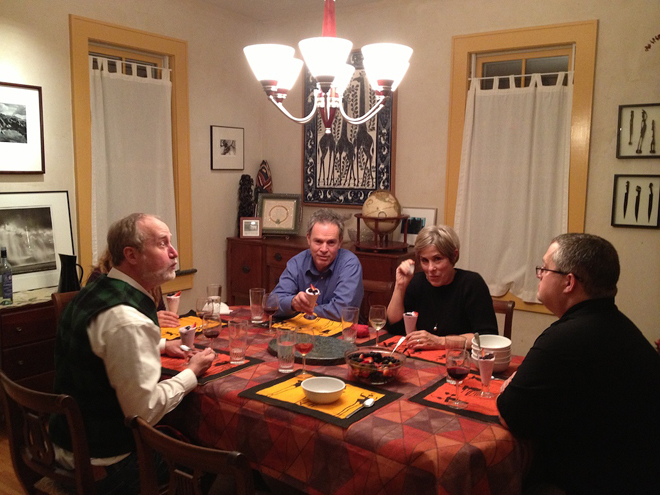 Glen, (Jamie), Mark, Marshall, Dave (and Shannon) gathered around the table for dessert. With the New Year, Dave and I rediscovered our dining room! As architects, we’re constantly renovating our home. That means it’s usually in no shape to show. And as collector/artists, we tend to fill our space with papers, objects, frames, art and construction supplies, and other materials waiting to be incorporated into some design or other. To be more specific, the dining room in our house has served as Dave’s photographic archive for years. It’s been chock full of framed prints, storage shelves, packing materials, and the like. Uncovering the room was a challenge and a thrill. When Dave transferred his photographic archives from our dining room to his downtown studio we knew we had to celebrate. Two 2012 accomplishments aided our celebration: (1) last fall, Dave installed enough new porch flooring for guests to access the front door, and (2) in July, I had our dining room table re-built (to overcome structural damage that resulted from the tripod-leg design combined with old age). So although we hadn’t hosted a dinner party in around five years, we decided to give it a go. The cats were thrilled — they love to meet people and entertain! We planned a fairly simple meal and invited over some friends who’ve hosted us for dinner more times that I can count: Marshall & Glen McClure and Jamie & Mark Lewis. Together (we six people and four cats), made an expedition into the unknown space. I’m happy to report that we had a blast. Everything turned out well and we look forward to more expeditions into the room next fall…. …and Dave’s selection for dessert (Liberte yogurt!?!!) was a hit with everyone. Lucca (and Pisa, Pescia, and Siena) loved the attention! Thanks, Jamie! We look forward to more expeditions….